Fido occasionally partners with charitable and animal welfare organisations to make certain chipping-related services available at a discount, or free, to the general public. These initiatives can include chip scanning, provision of new chips, implanting of chips, registration of chips and certification of chips. Please note that any dogs registered after September 2015 will automatically receive certificates (now included in the registration fee), whereas uncertified registrations prior to that date will now need to be certified. If a dog has an un-certified pre-regulations implant, and is already registered on Fido, we will attempt to contact the owner to arrange a discount certification. For details on any current campaign, please check the news page. The previous owner should have given you the top part of the dog's Certificate of Registration, to complete the reverse with the Change of Owner details. The previous owner has to complete the lower portion of the Certificate in order to relinquish ownership to you. The Certificate also contains details of how to perform these actions online. As a new owner, there is a fee for the issuance of a new Certificate. Take your dog to the vet for scanning. Your vet will use a "Red Form" to register your dog and have a Certificate issued. Remember to bring photo ID and proof of address. Note that Fido staff may make contact with the previous owner to verify ownership. (If this is a problem, discuss with your vet.) There is an administration fee associated with the certification process. Take your dog to the vet for microchipping. Bring your photo ID and proof of address. Ask your vet to register your dog with Fido. Bring your dog to your vet to be scanned. These are pre-Regulations dogs that have to be compliant with the Regulations since the end of March 2016. Use the "Chip Checker" to see if the chip number is currently known to Fido. It may be known, but it will still need to be Certified by a government approved database, and pre-Regulations dogs known to Fido can get their Certificates from Fido at a discount upon request. Bring your dog to your vet to be scanned. Also bring your photo ID and proof of address. The vet can discover if the chip is on an official database and can arrange registration if necessary. A rough guess will have to do. If you believe the dog was probably born before mid-2015 then proceed as if it were a pre-Regulations dog. The breeder will have a Certificate of Registration with the breeder's details and the pup details. The Certificate will say that the breeder is the current owner of the pup. The breeder uses the bottom part of the form to relinquish ownership to you. The breeder should give you the top part of the form so you can claim ownership. Your claim of ownership is only processed after the breeder has relinquished ownership. The Certificate also contains details on how to do all of this online. It is required by law that the pup be microchipped. There are no exceptions. The law also requires that the breeder not be the person who implants the chip in the pup. The breeder should have taken the pup to an independent vet for microchipping before giving the pup to you. You should bring the pup to your vet and arrange for the microchipping status to be resolved. Contact the breeder, who has an obligation under law to formally relinquish ownership. You should have the top part of the Certificate of Registration; follow the details on the Cert to go online and inform Fido of your interest in the dog. If you have been waiting more than a week, contact Fido for more assistance. Contact your vet, who can liaise with the breeder and/or Fido on your behalf. Professional dog breeders are engaged in commercial transactions with legal oversight and they are obliged to adhere to the Regulations as set out. As a last recourse, your vet can arrange a re-registration with Fido and/or lodge a complaint with the authorities. This is incorrect. When the pup is born, it must be microchipped and then registered to the breeder who is the owner at that point in time. When the registered pup is given to the new owner, the initial Certificate of Registration is used to conduct a Change of Ownership. The new ownership of the pup is only officially recognised when the Change of Ownership has completed. A pup cannot be sold legally in Ireland unless its ownership is already confirmed by a Certificate of Registration. Ordinary owners are treated the same as breeders, but ordinary owners are usually not familiar with the rules and regulations. In this case your best course of action is a visit to your vet who will be very understanding. Bring any documentation you received, and bring photo ID and proof of your address. I am a dog breeder, what do I do? Arrange with your vet to have the pups microchipped and registered to you. When you sell the pups, use the Change Of Owner form on the back of the Certificate of Registration to relinquish ownership. You can also do this online, and there is no fee. Arrange to bring your pups to the vet for microchipping. The law does not permit the pups to leave your premises unchipped except to travel to a pre-arranged visit with the vet. When you sell the pups, use the Change Of Owner form on the back of the Certificate of Registration to relinquish ownership. You can also do this online, and there is no fee. When you sell the pups, use the Change Of Owner form on the back of the Certificate of Registration to relinquish ownership. You can also do this online, and there is no fee. Before the end of March 2016 there was some flexibility regarding older dogs and their registration. This flexibility is no longer present. As the current owner of the dog, you are legally obliged to have the dog microchipped and get a Certificate of Registration. To transfer ownership to another person, you are legally obliged to follow the Transfer of Ownership procedure that is outlined on the Certificate. You should bring your dog to the vet immediately for microchipping and registration with a government approved database such as Fido. When the time comes to give the dog to the new owner, follow the Change of Ownership details at the back of the Certificate. If the Chip Checker says that Fido knows your dog's chip and those details were known to Fido before the introduction of the Regulations then you can request a legal certificate by using your Fido login and going to the Edit Details section where the procedure is outlined. These Certificates are issued to our "Legacy" customers for a nominal fee that covers processing, printing and postage. If you do not have a Fido login (e.g. you did not supply your current email address) then you can request a "Legacy" certification via the www.chipcheck.ie form. If your dog is on another (recognised) database in Ireland then make contact with that database to obtain a legal certificate from them. Remember that the Regulations require that they satisfy themselves regarding your identity and address, and confirm any other details relevant to the printed Certificate that they issue. Alternatively, you can choose to have your first legal Registration with Fido, and you can start that process by making contact via the www.chipcheck.ie form. The Regulations do not apply to owners outside of the ROI. Use the Change of Owner process (online or by post, per the lower portion of the cert) to indicate the country to which the dog will be going. Once you have relinquished ownership, there will be no subsequent new owner recorded on Fido and no further Certificates will be issued. Remember, relinquishing ownership does not cost the owner anything. My dog is chipped, do I need a cert? Yes, you need a Certificate, which is a printed legal document confirming the information that is currently registered on a government-approved database. Dog owners are required to keep the Certificate in their possession while they own, and are responsible for, their dogs. The certificate from Fido comes in two parts. The top part shows the registered details, the bottom part has details about the owner. On the reverse, the top has a form that a new owner can use to claim ownership, and the bottom has a form for the existing owner to relinquish ownership. If your dog is already on Fido's old reunification database (the Standard Registry) and you have a Fido account associated with your email address, you should log in, verify/update your dog's details and then click the button to request certification. Fido staff will then examine the records, cross-check with other services, and email to you the discounted administration fee payment details. Follow the emailed instructions to complete the process. In all other cases, use the www.chipcheck.ie form or visit your vet for assistance. You have an informal printed record from the old Fido system. You still need to get a new legal Certificate of Registration. If you have login details for Fido, you can revise your dog's details and then request Fido staff to arrange the legal Certificate. Otherwise contact Fido via the www.chipcheck.ie form. The previous owner should only have given you the top portion. The lower portion contains the previous owner details (on the front) and should not have been given to you. The back of the lower portion is filled in by the previous owner, who sends it to Fido. It is up to you to ensure that you have informed the previous owner who you are and where you live. You can send the lower portion back to the previous owner, or you can complete the top portion (Change of Ownership) carefully and post the entire form and fee to Fido, who will attempt to resolve the issue with the previous owner. Alternatively, bring the Certificate to your vet. If you have changed your address (or your name, legally) or contact details then you will need to get a new certificate issued. You can use the www.chipcheck.ie form and in the comment box just say you are changing address, and our staff will contact you soon to revise your certificate. Consult your vet who must perform an ISO 11785 scan of your dog. Your vet will then communicate the details to Fido for correction. The name is not essential. The date of birth can be approximate (or in the case of pre-Regulations dogs, may be absent). Colour and markings can also be approximate. Breed should be reasonably accurate. Gender must be correct. If the information on the certificate conflicts with the reality of your dog, contact your vet to arrange a re-registration. The Unique Identity Code of the registrar must be present. The UIC of the implanter should be present for any dog implanted after 1 June 2015. If you had the dog re-registered, the implanter UIC may be replaced by the UIC of the vet who scanned your dog to confirm the chip. Contact the vet who registered the dog to confirm these codes are correct. Minor typographic errors will not invalidate the Certificate, but if there is an error in your phone/email then these should be corrected. You should contact the vet who registered your dog with Fido to arrange a correction. If the error was because of a mistake in the data that you supplied to the vet or Fido, you may incur an administration fee. Any re-issued Certificate or one arising from a change of ownership will cause the access codes of previous Certificates to be invalidated. If you relinquish ownership of a dog (details on the Certificate) then your owner's PIN will no longer function. The PIN on the top part of the Certificate is for verifying the online details, while the lower PIN is only for the dog owner, to edit reunification details or change the dog's status. That is a QR code. If you have an Internet-enabled mobile phone with camera and a (free) QR app you can scan the code and follow the link to compare the online chip data with the data printed on the Certificate. If you find that the data is different, contact your vet as you may be in possession of an old or fraudulent certificate. This is a rare situation, but both chips must be registered. You cannot be sure which of the two chips will respond when the dog is being scanned, so each chip needs to be registered. People who use scanners almost never attempt to find a second chip because this is so rare. If the second chip is not an ISO chip, some ISO scanners will still detect it. In this case, we advise that the non-ISO chip be registered with Fido on the Standard Registry, which can only be done through a vet who contacts us in writing. Non-ISO chips will not appear on many registries because they only support ISO formats. Fido staff have additional access to the non-ISO records, so when one of these chips is discovered, our staff are contacted directly by vets and pounds for assistance. Contact your vet who can scan your dog to confirm the chip details before contacting Fido to re-issue the certificate. Contact your vet to confirm that your vet has a Fido UIC, as only official UIC holders may register dogs on Fido. Bring your dog to your vet, who will first check that there is no chip present already. Your vet will inject a sterile chip (the size of a grain of rice) and fill in some forms. You must show a photo ID and proof of your address, and supply some additional contact information. In some cases your vet will be able to register the details online and your certificate will arrive in a few days. The process takes at least a week longer if your vet sends the forms to Fido by post. Some countries do not use the International Standard for dog microchips, so you will sometimes find chips with 9, 10 or 12 letters and digits instead of the standard 15 digits. Not all of the scanners used in Ireland can read these foreign chips, which could delay or prevent your dog being returned. Fido has been recording these chips for years to give the dogs some chance of reunification. Nevertheless, the new Irish Regulations stipulate that the only certifiable chips are those that comply with ISO Standard 11784, which are the chips with 15 digits. If your dog does not have an ISO chip, please visit your vet to have a second, compliant chip implanted and registered so that you can receive your Certificate of Registration and avoid reunification problems later. If you have a dog that is staying in Ireland for more than three weeks then the law requires your dog to be microchipped, registered and a Certificate issued to you. If your dog's chip is a standard ISO 11784 type (with 15 digits) then most vets can do a "red form" registration on-the-spot. If your dog has a non-ISO chip (not 15 digits) then a new ISO chip should be implanted by a vet, registered and certified. In rare cases a second chip may not be advised, so the vet must complete a red form to be posted to Fido for special treatment, which will result in the dog being included in the Standard Registry and the issuance of a Certificate that will be clearly marked "Non-ISO". A Non-ISO Certificate cannot be used for Change of Ownership, you will have no online access to edit details and so you will need to contact Fido for any further assistance. If your pet is not a dog, but is already microchipped, you can ask a vet to submit a red form to Fido to add your pet to the Standard Registry. Be advised that all chip scanners in Ireland will read ISO 11784 chips, and only some of the scanners have the ability to read other types of chip. For this reason you are strongly encouraged to ensure your pet already has, or will get, an ISO chip. On your return to your own country, if your pet already had a non-ISO chip it will still be detected by the scanners in your country. A new ISO chip may also be detectable in your country, so you might consider registering it with a local service. It would also be helpful to let Fido (or the vet) know when you are leaving with your pet. You will be breaking the law if you possess or control a dog in the Republic of Ireland that has not been chipped and registered in accordance with MODR (S.I. No.63 of 2015) from the end of March 2016. Please note that dog licenses and pedigree papers are not the same as Certificates of Registration. Under the Regulations, only a qualified person may implant microchips into dogs in Ireland. To be qualified, one must either have been trained as part of recognised veterinary qualifications and be listed publicly by the Veterinary Council of Ireland, or one must be trained in accordance with Section 11 of the Regulations by a qualified practitioner of a recognised database provider, be publicly listed (online) by that provider and be issued with a certificate confirming the completion of implant training. In addition to the many VCI-listed vets and veterinary nurses trained to use the Fido system, there are many people trained by Fido as lay implanters who can implant and register dogs. The Regulations prohibit an implanter from implanting her/his own dogs or the dogs of anyone directly connected, such as a close relative or co-worker, so if you happen to be an implanter yourself then you will have to find an independent implanter if you want one of your own dogs to be microchipped. I already have a certificate! If you have a printed certificate that lists the chip number, age, breed, colour, markings and address of the dog, the date of implanting and identity of the implanter (a Unique Identifying Code), and the details of the owner, issued by one of the database providers recognised by the government as proof of what has been recorded, and all of the data is correct, then you have a valid certificate and you have no further obligations under the law. If your dog was born before the regulations took effect, then the details of the implanter are optional. If your dog was already on Fido when the regulations came into effect, and you applied for a legal certificate then your certificate is valid even though you did not have to present proof of your identity. If you got your certificate from somewhere other than a government approved database, or you printed it yourself, or it is hand-written (even by a database employee), or the information on your certificate is not correct, then your certificate is void and you will need to apply for an official Certificate of Registration. Your vet will be glad to assist. 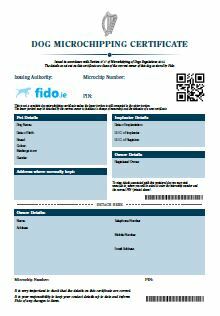 Fido certificates are printed on special paper with a number of security features. Beware of forgeries. Scan the embedded QR code to verify. Is my dog license not enough? The dog license is about you and your legal permission to have a dog or dogs under your control, an entitlement that can be withdrawn. The dog license does not identify an individual dog, and a general license only identifies your premises. To accurately identify a dog one needs something like a unique implanted microchip. For a microchip to work properly, the owner details must be accurately stored on a recognised database. The Certificate is a statement of what is on the database, and this might not change for the lifetime of your dog and therefore might never need to be renewed. The dog license and the Certificate of Registration serve different purposes. This is similar to the difference between a driving license and a car's registration. A car owner must have a driving license and the car's registration documents, while a dog owner must have a dog license and a Certificate of Registration. There are no stated plans to merge the functionality of the dog license and Certificate of Registration. This is usually reported following a Chip Check. In most cases the registered previous owner is actually the breeder and the law requires a change of ownership to be performed. Sometimes the other listed owner is in fact someone else in your household, but Fido staff cannot tell from the available information so they decide that a change of ownership is needed. If it is just someone else in your household, respond to Fido to explain and you might only need a discounted Legacy registration or a simple edit (which Fido staff usually do for free). If there is a mistake due to Fido, a correction will be made and a new certificate issued at no charge. In all other cases, the legal requirement is for a full change of ownership, which usually involves Fido contacting the other owner to confirm the details. If the other owner was a pound, charity or animal welfare organisation, Fido staff will take care of the paperwork and you cover the processing fee. If you self-registered before the introduction of the new Regulations, you may have mis-entered the chip number. Your implanter or registrar may have mis-entered the chip number. If handwritten forms were sent to Fido they may have been mis-entered due to legibility issues. Your chip number may be correct, in which case the other chip must be wrong. One of the chips could be fake. Fido is obliged to report the discovery of fake chips. Sometimes the only way to be certain of the chip numbers is for one or both pets to be re-scanned by vets. Fido is obliged to clear up any discovered ambiguities with the help of vets and pet owners. Remember: reunification will not work unless the recorded chip numbers are accurate. Under law, pet passports for dogs must now be accompanied by microchip certificates and inspectors must satisfy themselves that the two match. It is in your best interest to ensure that the details match exactly to avoid problems bringing your dog out of the country. Chips that were implanted prior to the 2015 regulations may have their implant/scan date marked as "Pre-regs" or "Pre 1/6/2015" or similar, and inspectors should be aware of this situation for pre-regulations dogs. If you are having your dog implanted/scanned, with the intention of using a pet passport at some point, advise the registrar so that you are both sure of the dates that will be recorded in the forms. What happened to the old system? The "Old" Fido is no more. We have been upgrading continuously for years, and at the end of 2016 we announced that the old system would be shut down. Many people still had unregistered dogs in the old system, so we spent a year doing whatever we could to help get these registrations certified. A year after we put up the sign to say the old system was going, we finally turned it off. None of the old data has been lost. It is now part of the Standard Registry where it will continue to enable the reunification of lost pets. If you were previously logging into the old system to keep it up-to-date, you can now log in via the Standard Registry. You just need to remember your chip number(s), the email address you used to log in, and your Fido password. If you don't know your pet's chip number, visit your vet to get the chip scanned. In addition to confirming the number, this will reassure you that the chip is still working. Your vet can also liaise with us to update your account. For security reasons, we only contact the person on file or communicate through a vet who has confirmed your identity. Fido will happily register cats, and has been doing this for many years. In fact, Fido will register any pet that has a valid microchip implanted. Unlike dogs, you don't need to get a Certificate and there are no further fees if you want to change certain details or change ownership. Registration of cats with Fido is for life, regardless of how many future owners are involved. Due to the simplified nature of registration for cats, Fido invites cat owners to use Fido's Standard Registry, which allows you to provide all your and your cat's details, and pay the once-off fee for lifetime registration. The Standard Registry is also available to rabbits, turtles, ferrets and any pet that is not a dog. Fido has always treated your privacy and the protection of your data as a high priority. Generally Fido initially collects a description of your pet and your contact details and this data is registered with your consent for us to reference this data at some later date if your (lost/stolen) pet is found. Fido also provides basic services to update your data so that it can continue to serve the purpose of being able to reunify you and your pet. Your personal data is not used for any purpose where you could be identified without your consent. For more details, refer to our Data Protection page, and additional summaries that are included in our portal pages. Like you, we want everything done quickly, but we also want it done correctly and in accordance with the law. In the case of scan registrations, Fido is obliged to contact vets, previous owners, breeders, rescue facilities etc. to confirm the details of each dog to the best of our ability before certification. This takes time. For implant registrations, vets can input the details online and have a cert out to you in the post in a matter of days. Some vets working in partnership with Fido have the facility for producing an official printed Fido certificate in the practice, immediately after implanting the chip. This facility is available to vets/pounds where the dog is likely to be re-homed or exported soon after chipping. It is our aim to conclude each certification within 10 working days. If it takes a bit longer in your case, perhaps because of the time it took for a few ahead of you in the queue, we apologise and hope you understand. For all those vets, pounds, charities, breeders and ex-owners that we are regularly contacting, non-stop, thank you also for your understanding. If you are expecting your cert in the post, please note that the accuracy of the address is very important. When the registrar shows you the form during registration, take care to check that the details are accurate. Finally, if you have a really urgent case (e.g. you are taking the dog out of the country in a few days) ask your vet to intercede with us on your behalf. We will do our best to help. If you find any professional acting in a manner that is contrary to the information above, please report your concerns to a trusted vet. Fido has provided chip registration services since 2004 and is used by most vets in Ireland. Fido's team comprises veterinary and technology experts, administrative and clerical staff. Fido charges a small fee for registration and certification. If your dog is being microchipped and registered through your vet, the Fido registration fee is included in your vet's overall fee. If your dog's microchip is not already on the Certified Registry, you must attend your vet to process the registration. Microchipped dogs without registration and/or certification should be evaluated by Fido staff using the ChipCheck service. Normal registration fees apply, though in some cases discounts will apply. Fido staff will advise you of the applicable fee by return email. There is no fee for relinquishing dog ownership to a new owner. The new dog owner will incur an all-in change-of-ownership fee of €15. Cats etc. : The fee for self-registration of cats, rabbits etc. on the Standard Registry is €15 payable online via credit/debit card, or a registration voucher code supplied by your vet. Participating vets can also register pets to the Standard Registry using their dedicated Fido Portal. The initial Standard Registry fee is a one-off, and there are no further fees for the lifetime of the pet, even if the pet gets a new owner. Now that you know what we do, pick the next item below depending on your needs. You can also check with EuroPetNet to see if the chip is known to any other EPN registries in Europe. In addition to being known by a government-recognised registry, dog chips must also be certified. You can read about dog microchip certification elsewhere on this page, including our FAQ section. Registration of dog microchips is done through your vet. If your dog is not microchipped, take it to the vet as soon as possible. If you are not sure the chip is known to Fido you can use the quick chip check service on this page. If you have an official Fido Certificate in your hand you can verify that the certificate is genuine and up-to-date. If you have an Internet-enabled phone with a QR scanner, you can use that too. If you are not sure if/where your dog is registered/certified, fill in the form to ask Fido staff to do a complete check for you. This could take a few days to complete. If you have an uncertified dog on the old Fido Standard Registry (pre-2016) then use the ChipCheck form to contact us for assistance. Certification is now a legal requirement. Remember, in addition to being microchipped, dogs are legally* required to have their chips certified and owners must possess an up-to-date certificate. Registration of cats can be done online by you, or through your vet. Fido's Standard Registry remains available for cats, birds, ferrets and many other pets that can have an implanted microchip. Fido is not just for dogs! The Standard Registry, like the Certified Registry (for dogs), will assist in the reunification of lost or stolen pets, and in most cases includes registration with EuroPetNet. Unlike the Certified Registry (for dogs), the Standard Registry allows pet owners to make their own changes to the registered information at any time without any further fees. Once you have registered your cat, bird or other pet (not a dog) with the Standard Registry, you and any subsequent owners of the pet can edit the information at any time for free. You do not need a printed certificate for a chip in the Standard Registry. If your cat, bird or other pet (not a dog) has been microchipped then register now. If the implanting vet gave you a chip number AND a Fido registration code then your registration fee is already included. Otherwise you pay online for registration via Debit/Credit card. Alternatively, most vets in Ireland can register your pet with Fido on your behalf. If you think your pet's chip is on our system and want to be sure, you can do a quick chip check on this page. Helping lost pets is why Fido is here. Have you lost a pet or perhaps found an animal that might be a lost pet? Fido has advice to offer in both cases. If you represent an animal rescue or welfare organisation and you have a Fido search account, log in using your UIC and password to search the Fido repository. If you do not have a Fido search account, use EuroPetNet to determine which registry has details of the pet's owner, and contact the registry administrator (through a vet if necessary). All new microchip implants performed by the DSPCA are registered with Fido. Dogs whose chips were previously recorded by DSPCA are being transitioned to Fido, and owners were contacted during 2016 to arrange certification. If you received a phone message from Fido and have concerns about the data presented, you can write to Fido at the postal address below or contact the DSPCA. By law, all dogs need Certificates of Registration, including those that were registered with Fido before the law was introduced. Fido is making contact with dog owners who were registered before September 2015 to enable them obtain the necessary Certificates. You may receive a message from Fido by email or phone with regard to your dog's registration. Being registered on Fido is not enough to be compliant with the law. It is necessary to ensure that all the legally required information is present and correct, and the registry (Fido) can then issue a Certificate to this effect. Dog owners must be in possession of this printed Certificate in order to be compliant with the law. Pre-2015 customers: We announced the intended closure of the old system in December 2016, and one year later it finally closed. Anyone who had active accounts on the old system will still be able to access the details on any registered pet via the Standard Registry. This includes uncertified dogs. Upon login you will be asked for details to assist with obtaining your dog's certificate. All certified dogs will be on the Certified Registry and you can log in there using the details from your printed Certificate. The Royal Canin offer is operated by Royal Canin and is intended for new pet owners (i.e. not breeders). Fliers for the offer are distributed with most certificates from Fido. Wait until your Certificate arrives in the post as chip codes will not be accepted by Royal Canin until the day after the Certificate has been printed. When you get your Certificate, visit www.fido.royalcanin.ie to claim your free food from Royal Canin. You will need your certified chip number in order to claim. Registration for cats does not involve a Certificate, so in this case just wait until the day after registration with Fido before claiming your food voucher from Royal Canin. The Royal Canin offer only applies once per certified chip, so be advised that a previous owner of your pet may have already claimed from Royal Canin. Royal Canin operates a separate programme for dog breeders, so Fido generally sends details of the Royal Canin offer to the first long-term registered owner when the Certificate is posted to that owner. By the time the Certificate arrives in the post, Royal Canin will be ready to accept the 15 digit chip number to approve the free food voucher. Fido staff have no ability to control the Royal Canin website or any offer thereon, and cannot intercede on behalf of owners. If you are experiencing issues, such as confusion about who stocks their product, visit Royal Canin's FAQ page. Are you a vet surgeon/nurse registered with the VCI ? If so, sign up with Fido to obtain your UIC. Only registered vets, nurses and specially trained individuals with UICs assigned by Fido can avail of Fido's chip registration services. UICs are assigned by Fido to individual qualifying applicants for use only by those people. UICs are non-transferable and must not be used by other vets/nurses, even those in the same veterinary practice. VCI credentials are checked with the Veterinary Council before a UIC is issued. Fido also has facilities to support vets in Northern Ireland who have clients keeping dogs in the ROI. For information, please write to Fido.